We were able to play test 2 of the Red Alert scenarios (Epic sized) for Hurricon 18. This post only looks at one of those as I had to depart before the second game started….the boss had other plans for my time! Fleet Commanders set both sides and the UPF won the initiative. The UPF had numerical superiority but Sathar Capital ship density and some skilled play minimized that advantage. The Sathar side won the play test pretty decisively….with formations poised to take out space stations and launch invasions onto the planets when they won the game. Despite the severe drubbing my side received this upscaled version of Red Alert proved to be a blast as usual. Look forward to the convention! 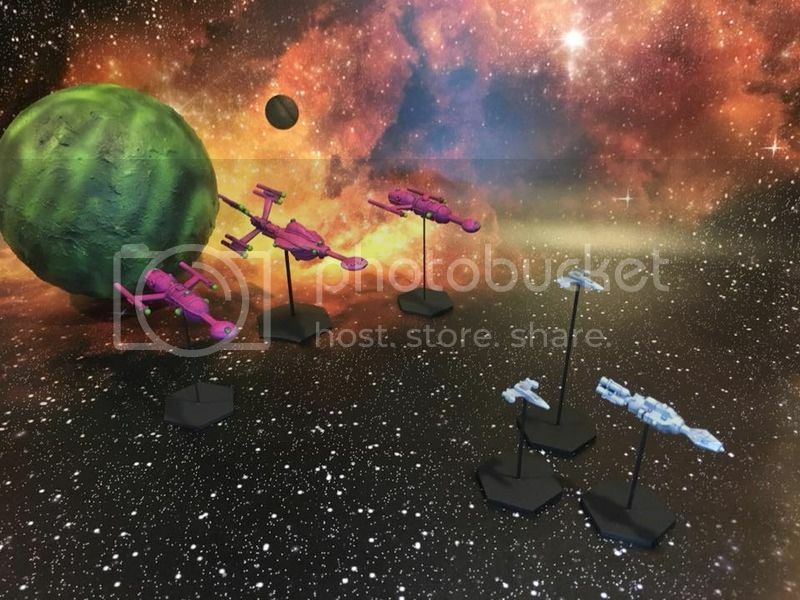 UPF Fleet Command has analyzed the Fleet SIM war games and has concluded that the Sathar Fleets now assembled at their Jump assembly areas each have the capacity to defeat the UPF formations opposing them. The Prenglar System SIM under 1st Fleet revealed aggressive Sathar maneuvers were more than a match for the defense originally devised. When ENDEX was called in the SIM the First Fleet was shattered and the Sathar were poised to strike planetside at both Morgaine's World and Gran Quivera. Squadron level AARs are ongoing to integrate lessons learned into the tactics and techniques for the upcoming battle. Due to the surprising defeat of the UPF 1st Fleet during the SIM, and the possibility of each Fleet failing in its defense of the initial Star Systems, each Fleet Commander is directed to break off contact with the Sathar if the system cannot be saved. If that decision is reached all remaining vessels capable of Jump will move to secondary Defense Areas in nearby Star Systems. Key assets in each system such as Space Platforms, Armed stations and orbiting repair docks are to be fortified and defended from boarding assaults if practicable. Planet surface defenses must be prepared for sustained isolation and resistance if UPF fleet assets withdraw. Maximize the use of all subsurface bunkers and shelters for both military and civilians. That's a lot of vintage Star Frontiers ships on display there! They were notorious for lead rot, or are these modern repros? All are 3d printed from shapeways. I had some original Sathar ships a while back and eventually tossed them as they deteroriated over time. They were the only models I have ever owned that had that problem. Wow, that's a lot of ships! So the ORBATs are basically scaled up from the Knight Hawks game….one old TSR ship = a squadron in Red Alert. Exceptions to that formula on the capitol ship side though….almost a 1 to 1 on those big ships. I said in another post this was 30 years in the making for me and it is true…fortunately Red Alert can accommodate the KH campaign if you tweak a couple of things so that the battles are between fleets and not a couple of ships per side….like in the old days. This is fantastic. Very motivational. I'm running a "retro" Knight Hawks game at GameHole Con in Madison, WI next month and this is inspiring. Of course, using Knight Hawks, there will be about 20 ships on the table total. Amazing to see in person. Everyone seemed to have a great time. One of the battles was decided on the last turn, talk about a nail biter! Dave those are cool ships….mine turned into a mess and I had to get rid of them…maybe we need to have a Star frontiers convention som day!